The Kalalau Trail. Even if you don’t know its name, chances are that you’ve heard of it. This trail, among others, is always listed as one of the “most dangerous” trails in North America, or the United States. It is a trail with steep drop-offs, it is a trail with narrow sections, it is a trail that is strenuous, and it is much more. With an introduction like that, you may be wondering why you should even attempt to hike the Kalalau Trail; especially as it is eleven miles one way. The reason you should attempt to hike the Kalalau Trail is simple: because it is there. If George Mallory’s iconic reason isn’t enough of a reason for you, you should hike the Kalalau Trail because of the scenery. While there are many beautiful spots on Earth, the Kalalau Trail winds through some of the lushest, greenest, jungle-iest terrain on the planet. 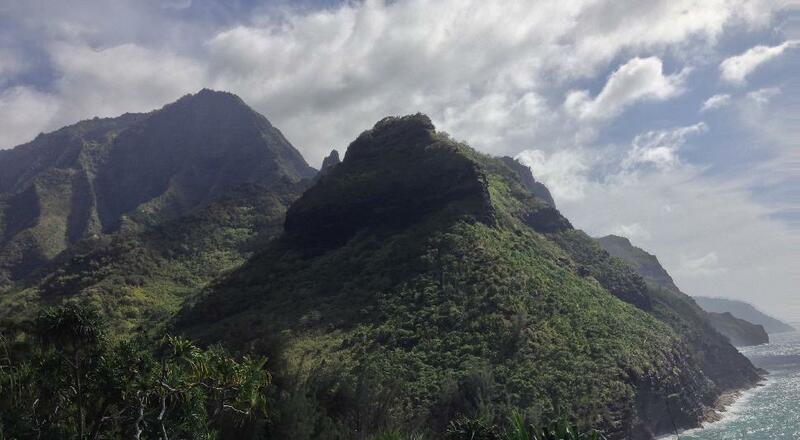 In addition to the impressive plant life that surrounds the trail, the trail provides stunning views of the Na Pali Coast, views that have been featured in movies such as King Kong and Jurassic Park. Despite the allure of super-duper fantastic views, many people are hesitant to attempt the Kalalau Trail because of its distance: eleven miles one-way. And, unlike many other trails around the United States, the eleven miles of the Kalalau Trail are strenuous. They are long miles; they are tough miles; and they are miles that eat time. Most people elect to backpack the Kalalau Trail specifically because of the time it takes to traverse all eleven miles. However, you don’t need to backpack the entirety of the Kalalau Trail to appreciate its scenic beauty; or to appreciate its difficulty. The first section of the Kalalau Trail from Ke’e Beach to Hanakapi`ai Beach is only four miles roundtrip, and this hike provides stunning views of the Na Pali Coast, along with a great spot to have a beach picnic at the halfway (two mile) point. I recently hiked this section of the Kalalau Trail in April of 2014. I was a little hesitant to try the Kalalau Trail myself as I had heard that over one hundred hikers had had to be rescued two weeks before because of rain and floods, but on the day I set out, I was lucky enough to have a mostly clear and sunny sky. Before I even hit the trail, I had to navigate the Ke’e Beach Parking area – which to me was the most dangerous part of the hike. Because of the Kalalau Trail’s notoriety, the area is quite popular, and it did take me a while to find a spot. Once I found my spot, I walked to the trailhead, and realized that all of the talk about the trail being strenuous was not a mere rumor. From the trailhead, the trail heads straight up through the jungle, via a series of straightaway sections and the occasional switchback. In addition to the immediate elevation gain, I found that the trail was strenuous because of the terrain in and around it. While the Kalalau Trail has been trodden by many feet, I found that this is an area where nature still holds sway. The trail is made of unyielding rocks, along with strong dirt, and in places mud, which caused me to both watch my footing, and work for every foot of distance I traveled up and along the trail. Despite the difficulty, I was beyond happy to be on the trail, because every step provided me with a variety of amazing views. At a half mile in, the trail leveled out to a fantastic rocky outcrop, from which I could see Ke’e Beach behind me, and the rolling mountains of the Na Pali Coast ahead of me, along with the cerulean blue Pacific Ocean beneath me; this view was truly one of a kind. From the half mile marker, I continued along on the trail, which fortunately had leveled out a bit, before slightly descending. Along the way, I crossed seasonal waterfalls, which flowed up and over the trail, and passed under whispering trees. Finally, the trail began a long descent into Hanakapi`ai Valley at the one and three quarter mile (1 ¾) mark. 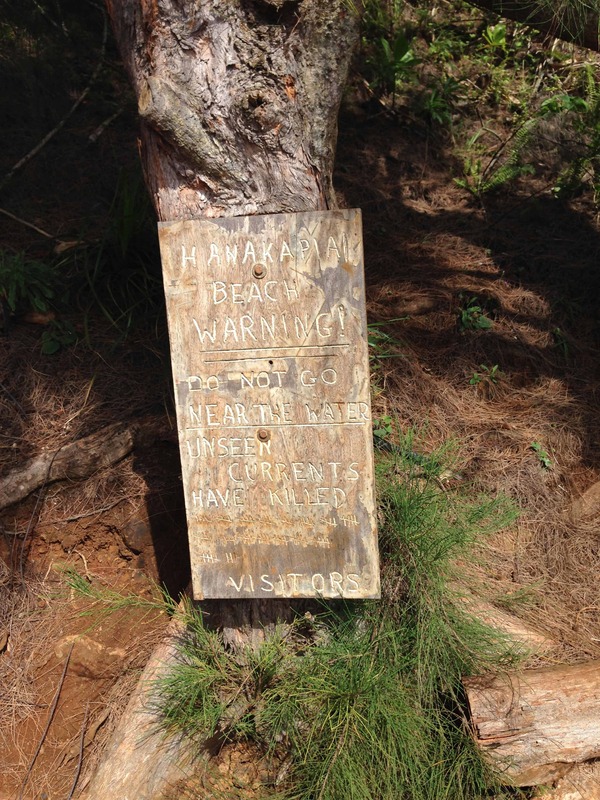 As I entered into Hanakpi’ai Valley, I was reminded of the dangers of the trail and the area that hid among the beauty by a hand carved sign. “Do not Enter the Water. Water has claimed _______ lives”. In the blank space, a number of notches had been carved, delineating eighty-two deaths to that point at Hanakpi’ai Beach. While I like a little risk, that sign was more than enough (along with its cousins) not to enter the water at Hanakpi’ai Beach. After the sign, I found myself in Hanakpi’ai Valley, and after crossing the river, at Hanakpi’ai Beach, which is a narrow strip of land, bounded by jungle. I left the trees, walked through the boulders, and sat down to watch the waves play across the beach, the coast, and everything in between. Even though I would have preferred not to leave the serene – and beautifully calm spot, I eventually headed back up the trail and to the trailhead at Ke’e Beach, feeling lucky that I had experienced one of the most gorgeous spots on the planet.